Home ♦ Coffee ♦ What is shade-grown coffee? Shade grown coffee is exactly what it sounds like: coffee grown in the shade. 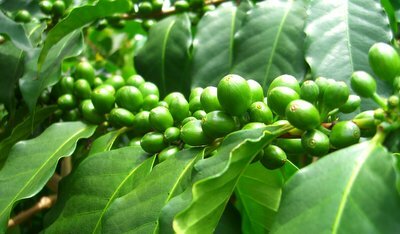 The coffee bean trees get little, if any, direct sunlight and the coffee beans, in turn, also get very little direct sunlight. Since coffee tends to grow in very temperate climates to begin with, this means that coffee trees are sometimes subjected to extreme temperatures. With shade-grown plants, they will remain in the shade of a high jungle/forest canopy for the majority of the day and their beans will not be subjected to extreme heat no matter how high the temperature climbs. Coffee trees actually thrive in the shade, but in some areas the forest canopy has been cut back to make room for more coffee plants and increase the yield of coffee crops. The beans that are subjected to high heat tend to ripen faster and are widely regarded to be less flavorful than their slow-developing shade-grown counterparts. That forest canopy also reduces the need for pesticides and leads to an increased biodiversity in the area, meaning that coffee that is shade-grown is more eco-friendly than that which is not.